Representatives from Laborers’ Local 355 present Teresa Durham, executive director of the KCC Foundation, and KCC President Mark O’Connell with a donation in support of student scholarships for the Bruin Open earlier this month. 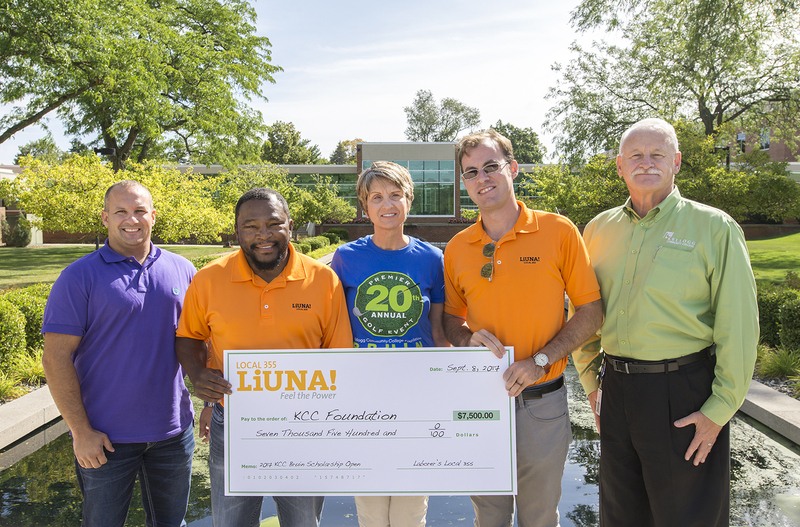 A record amount of $105,000 in scholarship money was raised for Kellogg Community College students during the KCC Foundation’s 20th annual Bruin Scholarship Open in September. The annual event – held Sept. 8 at Binder Park Golf Course in Battle Creek – is the largest fundraising event of the year for the Foundation and has raised more than $1 million over the past 20 years. 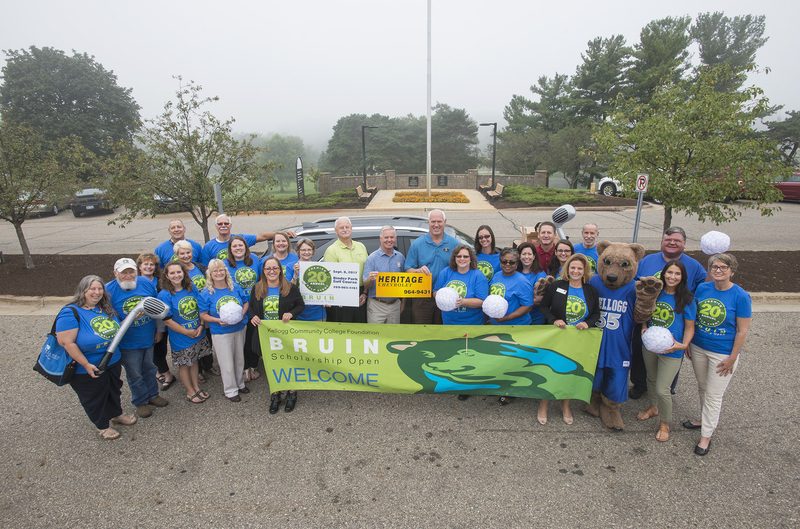 A full roster of 60 teams participated and 140 sponsors were represented in the Bruin Open this year, which included an 18-hole scramble, prize raffle, 50-50 raffle, special hole contests including a Money on the Green Putting Contest, live music, lunch and dinner. The event was coordinated by more than 70 members of KCC’s staff, retirees, volunteers and more than three dozen KCC student-athlete and honor student volunteers. Representatives from IBEW Local 445 present a donation in support of student scholarships for the Bruin Open in 2016. The group made a similar donation for this year’s event. Teresa Durham, executive director of the KCC Foundation, said this year’s event was a great success. Funds raised at the event this year will help support approximately 90 student scholarships. Team event winners, listed by division, are as follows. For more information about the KCC Foundation or to donate to student scholarships online, visit www.kellogg.edu/foundation.